The Jemez watershed offers anglers ample opportunity to catch trout. Several small- to medium-sized streams harbor rainbows, but the predominant fish are browns.NM Highway 4 follows the Jemez River throughout. The stream cuts through steep canyon walls and is replete with deep runs and pools. Surprisingly, the fishing is good even along the road. The Jemez River is formed where the Rio San Antonio is confluent with the East Fork at the prominent Battleship Rock. The Jemez drainage, located northwest of Albuquerque and west of Santa Fe is comprised of several small rivers and streams, most noted include the Rio San Antonio, Jemez River and Rio Guadalupe. Wild browns and rainbows claim reside in the high meadows, tight banks, deep runs, fast riffles and pocket water of these small rivers. 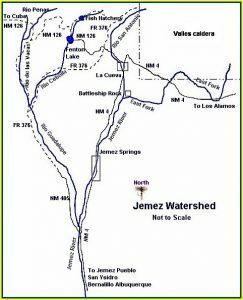 Most of the Jemez ranges between 15-30 feet wide and generally 2-3 feet deep with a few deeper pools reaching five feet. Cottonwoods, willows and alders are scattered along this freestone like river forcing anglers to wade up the middle. NM Highway 4 parallels the river so access is extremely easy. The Jemez is a low elevation trout stream, during the heat of summer water temps can soar making for a tough day. Winter on the other hand is cold but seldom freezing making this a wonderful winter fishery. Midge hatches provide the bulk of dry fly action during the winter months, however a well-filled box should include nymphs and streamers. Wild browns range from 8-12 inches, New Mexico Game and Fish stocks rainbows throughout the winter months. The Rio San Antonio starts high up in the Jemez Caldera on the soon to be public Baca Ranch. The San Antonio is mostly public from the Santa Fe National Forest/Baca Ranch downstream to the confluence with the East Fork-Jemez at Battleship Rock at which point it becomes the Jemez River. The upper stretches flow through long open meadows. Stalking and short casts are a must for success with these nervous browns and rainbows on the upper San Antonio. Below the small village of La Cueva, the San Antonio turns into a classic pocket water stream, featuring several miles of raging pocket water, plunge pools and the occasional small waterfall. NM Highway 4 parallels the boulder-strewn canyon where three pullouts offer easy access-Indian Head, Hot Springs and Deep Canyon. The Rio San Antonio is accessed from NM Highway 4 upstream from Battleship Rock, NM126 and F.R. 376 north from NM126. A great deal of the Rio San Antonio meanders like a snake through many grassy meadows. There are a lot of pools and deep runs, and some canyon areas where the fishing access requires some hiking but it can be worth the effort. The East Fork also heads on the publically owned Valles Caldera. Once on public land, there are many miles of excellent fishing. However, this stream cuts almost entirely through deep canyons. Some are very hard to get to but the fishing can be very rewarding. It’s always best to hike into the canyons beyond the access points before you start fishing. Some stretches of the East Fork are on private property so be sure to respect other’s property. The Rio de las Vacas and the Rio Cebolla, draining the northwest Jemez mountains, converge to form the Rio Guadalupe. The Rio de las Vacas has public access from the north and south but the middle portion of the stream runs through private property. Fishing is good in the spring but gets fairly slow in the summer as flow decreases. The Rio Guadalupe is my personal favorite and has the most water of any Jemez watershed stream. After several miles the Rio Guadalupe flows into the Jemez River near the Jemez Pueblo. The Rio Guadalupe flows into the “Guadalupe Box.” And that’s where the fishing gets good–and more challenging. There are a lot of deep pockets and deep runs for excellent dry fly and nymph fishing. The last week of April until about the second week of June there are incredible stonefly hatches. That’s the time to go if you can beat the spring runoff. The Rio Guadalupe is formed by the confluence of the Rio Cebolla and Rio de las Vacas, from this confluence the Rio Guadalupe flows south 10-11 miles until joining the main Jemez River at the town of Canones. NM Highway 485 and Forest Service Rd 376 parallel the 15-30 foot wild Guadalupe. The fast tumbling, boulder strewn canyon river is home to wild browns in the 10-14 inch range. There is a section designated as Quality Trout Waters. Adventurous anglers seeking solitude should consider the upper canyon between FR 626 and Porter. Many consider this to be the best stretch of the Guadalupe, the steep canyon walls and limited access scares most people. The most thrilling time to fish the Rio Guadalupe is during the Giant Stonefly hatch (Pteronarcys californica) in mid May to mid June. Unfortunately snow and runoff can coincide with this heavy hatch. During mild runoff anglers have realistic odds at 14-16 inch wild browns on giant adult stonefly patterns. Browns up to 20 inches have been know to be fooled by big stonefly nymphs fished deep. Take NM44 Bernalillo exit off I-25 to the town of San Ysidro. Head north on NM 4 which follows the Jemez River and the road continues to Los Alamos to the north. The Jemez River is about 50 miles northwest of Albuquerque and about 40 miles from Santa Fe.